Eden Hazard will be playing with Chelsea next season, after he played with, well, Chelsea for the last few weeks as the game of where he would end up grew and grew sponsored by fecking twitter. Bloody, social networking wonker told the site in the morning that he would announce whether he would be playing in royal blue or sky blue and then waited until the evening to break the news. Some of us watched about four hours of Sky Sports news waiting for the announcement. Joe Cole was on Sky blathering on about how Eden is the best player he has ever seen, so, now he is here let’s hope he grows up a bit. Voted the best player in France two years in a row, the 21-year-old has five years at first-team level already. Chelsea are not very impressed that he didn’t wait to make the announcement in the usual way but he is kid with a twitter account what was he going to do? Meanwhile: Petr Cech has signed for another four years. He will now be between the sticks until 2016. There is light on the horizon for England as Gareth Barry is ruled out of the Euros by a stomach muscle tear. Perhaps the manager will have to experiment with, say, 4-2-3-1 or even 3-4-3 – no, no, let us not run before we can walk. Conor Clifford made his debut for the Ireland U21 team this evening at the age of 19. Ireland played Denmark as a warm-up for their qualifier against Italy next week. He didn’t look out of place and came close with a free-kick that could have salvaged a draw. Denmark won 1-2. Frank Lampard may have a rest this summer after all as he pulls out of training with a suspected thigh muscle pull. He will have scans tomorrow. He will have been hoping for a last chance at international glory at 34 but then Hodgson is in charge we are not going to get out of the group. Liverpool have appointed Brendan Rodgers as their new manager. Brendan was youth and then reserve team coach with Chelsea back when Mourinho was in charge. Ironically he produces the kind of football Roman Abramovich seems to want. We are not sure if Liverpool is the best destination at the moment: it will quickly be evident if he clicks with the players or not. The appointment acts as a nagging reminder that Chelsea have forgotten to do something since the end of the season – can’t quite put our finger on it – something a football club needs – hmm – that we are missing at the moment. Fernando Torres scored for Spain as they warmed up with a 4-1 tonking of South Korea in Bern, Switzerland. Fernando’s was the opener and not one his proudest – the ball kind of cannoned off his head as he ran through a Korean attempt to play his offside, and looped into the net. Frank Lampard is out of Euro 2012 with a thigh muscle tear. The medical staff confirmed it this afternoon. It is very sad news and possibly the end of his international career at 90-caps. We are so blessed with talent in midfield that Jordan Henderson has been called up as a replacement. John Terry has received a three-match European ban for his knee in the back of Alexis Sanchez. He’ll miss the Uefa Super Cup and our first group game. I would have thought missing the final was punishment enough. The oddest thing about the red card, for once one even we couldn’t argue against, was how out of character it was. A bloke in our local just said, ”ah, typical John Terry” but it wasn’t. We can’t honestly remember him ever raising a knee or a sly boot – so why then – in a semi-final? Florent Malouda score for France this evening as the beat Branislav Ivanovic’s Serbia 2-0. Ivanovic had a powerful free-kick deflected over in the second-half. Oriol Romeu played for the Spanish U21 side as they marched towards their European championship with another comfortable win this time away in Estonia. Petr Cech’s Czechs were beaten 1-2 by Hungary in their last warm-up game ahead of the Euros. Given that they’d selected weak opposition to finish their preparations and dominated the game 1-2 must be a bit of a downer. At U21 level Tomas Kalas played for the impressive Czech side that is set to qualify for their European championships. While Milan Lalkovic was a second-half substitute as Slovakia lost at home to Romania. 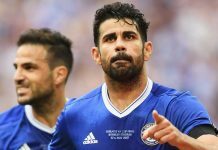 Hulk is to be the latest player signed by managerless Chelsea. Porto reportedly had a release clause in his contract of €100m but that turns out to be a crock the release clause was somewhat closer to €60m and we beat them down to €46 or £38m. News has again broken before the club are ready to make the announcement officially. Perhaps the club are on the beach for a few days. Hulk, Givanildo Vieira de Souza to his mother, is a Brazil international who has scored plenty of goals in Portugal. But many have questioned his technique. £38m sounds a lot for someone to play in Daniel Sturridge’s position. Maybe he tracks back. Hulk got the nickname from the television series of the 70s with bodybuilder Lou Ferrigno playing the Marvel superhero. Luckily for Hulk his father was not more smitten with Charlie’s Angels or he might have been Bosley. Another listless performance from an England team who had plenty of possession but could find no penetration and were frequently outnumbered in midfield. Hmm, we wonder, with the learning of ages how long it will take the England team to realise that this manager and formation don’t stand a chance of winning. What is that – the calculations have been done – the answer is in – after watching no team since 1966 win using their current tactics, it will be 442 years before the FA even realise that the problem is not the players but the tactics. Gary Cahill had to leave the field in the first-half with a jaw problem after Dries Mertens pushed him into Joe Hart as both converged on the ball. John Terry also left early but with a tight hamstring and should be fine. Raul Meireles and Portugal warmed up for the Euros by losing 1-3 at home to Turkey. It puts stuttering past Norway and Belgium into some perspective. Over in Africa the Ivory Coast won 2-0 with goals from Kalou and Drogba in a World Cup qualifier with Tanzania. Didier’s goals still count as goals while with Chelsea until the end of June. Gaël Kakuta played the dying stages of France U21’s win over Latvia. The French are very well placed. Gary Cahill will miss the Euros with a fractured jaw. Mertens apologised on twitter – the sincerest of media – but England’s coach has picked another Liverpool failure, sorry, Liverpool defender Martin Kelly to draft into the squad instead of Rio Ferdinand. If Liverpool had stormed the league last season you could understand an England manager selecting the bulk of his squad from such a successful team. Liverpool finished eighth. Picking Gerrard as your captain is a risk given that he hasn’t exactly shone on international duty for the last three-years. Picking Stuart Downing in midfield was absurd given the season he has had (36 appearances, 0 goals, 0 assists). Now he has replaced Frank Lampard with Jordan Henderson (37 appearances, 2 whole goals). Given that Hodgson was sacked by Liverpool last year perhaps he is auditioning for a return after he is sacked by England in June after only three competitive games.